It’s winter. There is about six inches of fluffy snow on the ground outside. Needless to say, we have been craving comfort food. No more vegan bean chili, thank you. I’m so beaned out. Sometimes I just want something that reminds me of being a kid. The days of meat and potatoes. And gravy! Meat and potatoes were the staples of my childhood dinners. I honestly cannot remember a dinner without one, the other or both. Another fine supporter was gravy. Always there to accompany potatoes! I loved creating a little mound of puréed potatoes, hollowing out the center and then filling it in with a pool of a salty broth. Should the gravy begin to leak from any unsuspected weakness in the potato mound, it had to be adjusted immediately! No leaks allowed! The mound could only be shaved off slowly from the top and dipped into the gravy, so that both the potatoes and the gravy would be eaten precisely together. It’s funny and precious what kinds of food games kids play. Oh, but that is the kind of food we’ve been craving. The kind made with love, for us. Something that doesn’t have to taste healthy or feel refreshing, but simply feels like home. Although it doesn’t hurt to be a healthy dish too! The following meal is so quick and easy to make. We made it together, and what better way to make a meal with love than for one another, right? 1: In a large saucepan, add potatoes, then fill with water about 1/2 inch above potatoes. Add 1 tsp salt. Cover slightly and bring to a boil. Reduce heat and simmer about 15 minutes. Potatoes should be tender enough to easy poke with a fork. 2: Remove from heat. Drain water into another container (save 1/4 cup for step 3). Place potatoes back into pan or a serving dish. 3: Add 1/4 cup potato water back to potatoes, add milk and margarine. Mash until desired texture. Flavor to taste. 1: In a large sauté pan, heat 2 Tablespoons margarine over medium heat. Add mushrooms and sauté about 5 minutes, until they darken slightly and begin to release juices. Turn heat to low and cover slightly to keep juice from evaporating. 2: Meanwhile, in a medium saucepan melt remaining margarine with milk and water. Add seasoning to taste. 3: Remove mushrooms from heat and add to gravy. Simmer about 5 minutes, stirring occasionally. 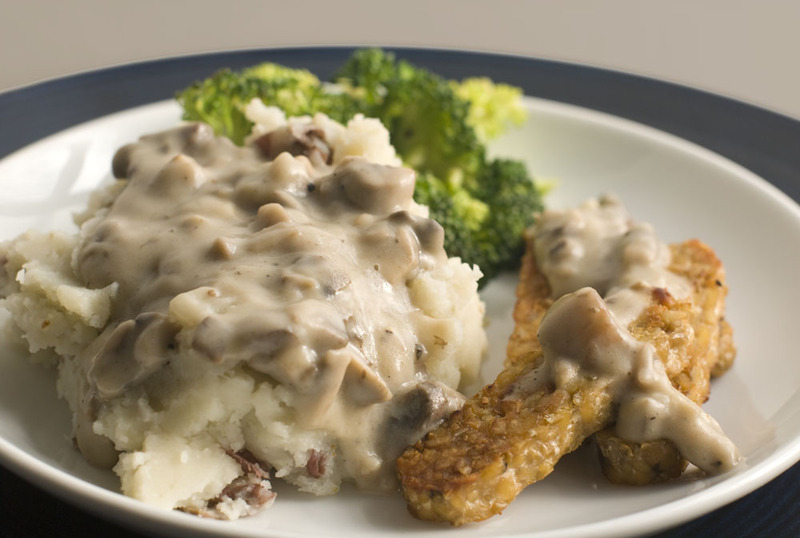 To create a thicker gravy, add one Tablespoon of flour at a time, until desired consistency. Whisk with a fork until flour becomes fully incorporated. 1: Heat oil in a large sauté pan on medium-low heat. Add broccoli florets and chopped stem pieces. Sauté about 3-4 minutes, just until broccoli begins to brown. 2: Carefully add 1/4 c. water to pan. Toss regularly and remove from heat once water has evaporated and broccoli becomes bright green. 1: Heat 1 Tablespoon oil in a medium sauté pan. Place half of the tempeh strips evenly in the pan. Sauté on medium heat until the tempeh strips become golden-brown and slightly crispy, about 3-5 minutes. Add 1 Tablespoon soy sauce and flip pieces so that the sauce is evenly distributed. 2: Plate slices and repeat with the second half of the tempeh block. We made this the other day! And it was delicious. We used pre-marinated tempeh (lazy), but still good. And it’s really good the next day too! Hooray! I love this simple meal so much! This should be our next dinner together.